Green peppercorn is native to India. Peppercorns come in different colors and tastes. White, black and green peppercorns all come from the same vine. They grow in clusters (like grapes), and are harvested in various stages of growth which give you the different color options. 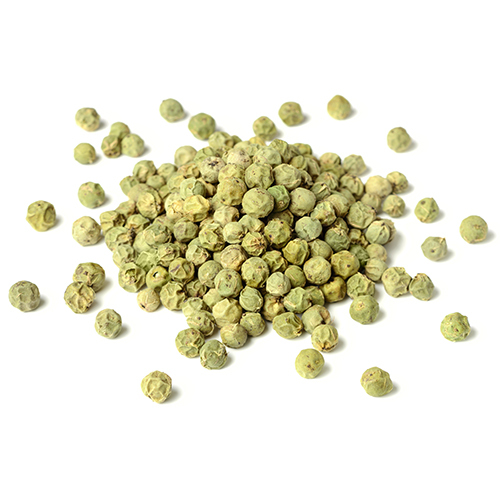 Green peppercorns are young when they are picked and dehydrated or preserved, with a resulting mild flavor. Green peppercorns are really unripe black peppercorns. Green peppercorns are often preserved in brine or vinegar and served in pickled form. In dried form, they don’t last very long and have to be used quickly. They are commonly found in Thai and other southeast Asian recipes and have a fresher flavor than their black counterparts. Whole peppercorns are often used to add flavor to milder foods such as vegetables, chicken, and fish. You’ll also find green peppercorns packed in jars of brine; use these whole or chopped in sauces, salad dressings, potato salads, pastas, and spreads. In Thailand, they are used in curries and stir-fries and have also been seen in Indian cuisine and French sauces. The black, white or green peppers are actually harvested from a single plant. The color depends on the different degrees of maturation and how the pepper is processed. Sowing pepper seeds can be done, but only fresh seeds are germinated, seeds are viable for very short period. The pepper plant loves extremely humid climates where temperature never falls below 60 F (16 C). Pepper fruit is harvested before maturity and dried in the hot sun. After drying it becomes wrinkled and black. Green peppercorns are picked when the berries are young and still green.